This article contains the stats, strategy, and guide for Rider - Alexander. We will update this as soon as the game comes out. 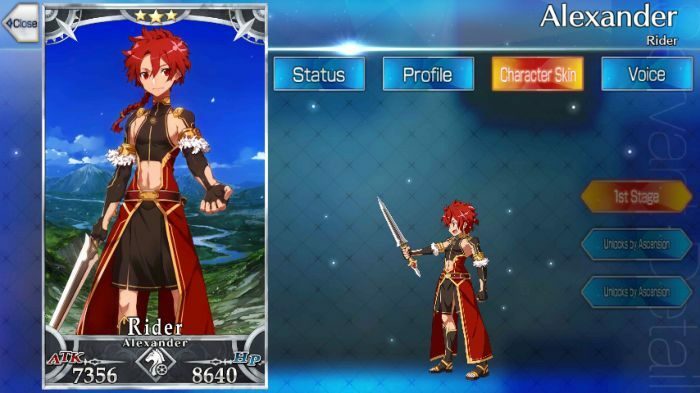 This article contains the skills, stats, growth, and ability of Alexander of the Rider class from Fate Grand Order [FGO]. Alexander is a Rider class servant that has several skills that can boost his own offensive power. In addition, this servant also has skills that can buff other servants in your party as well, making him a good support servant to those who are much more powerful than him. Ushiwakamaru is a good partner for Alexander as he can boost Ushiwakamaru’s offense. The classic skill Riding (found in most Rider class servants) which greatly increases the power of Quick cards could make the Ushiwakamaru-Alexander combo lethal. The 5 Star Craft Essence Imaginary Around can boost Alexander’s Quick cards by 25%. With the combination of this craft essence and Alexander’s Riding skill, his Quick card attack can deal massive damage against the enemy. You can also use the 4 Star Craft Essence Gandr (which boosts Quick cards by 15%) if you don’t have Imaginary Around. Divinity E Increases own damage by 100. Charisma C 3 7 Increases party’s attack for 3 turns. Charming Youth B 1 9 Chance to charm one Humanoid enemy for 1 turn. Signs of King C 3 7 Increases party’s Quick card performance for 3 turns. Alexander, the King of Conquerors, had a favourite horse. This horse, Bucephalus, followed him into the after life and became his noble phantasm. As the King of Macedonia, he studied under many philosophers. Alexander learned from the philosopher Aristotle. Some considered Alexander a genius in his own right. He often read the Iliad, memorizing every line. However, Alexander did not remain in just studies. he decided to make himself well-rounded. He took not only philosophy but also political sciences. While juggling those two, Alexander engrossed himself with legends. Amazed and inspired, Alexander decided to prove himself and become a legend himself. Thus, he began training as a soldier. Since then, he became a commander of his army and continued soldiering on. After passing away due to a fever, Alexander begged the Holy Grail to allow him to see the ocean. His desire, so great, that the Holy Grail decided to make him a Heroic Spirit. Unfortunately, he doesn’t have the appearance of his usual form of Iskandar, the King of Conquerors. He has a body of a boy, retaining also the mentality that of one. Alexander hates being told what he can’t do and will only listen to things he can do.